Cruise ship webcam "waves" are 100% free of charge. We will take control of our HD camera and zoom in on the "wavers". Friends and family back home can watch your sail-away live. Sail-away still image captures can be viewed for up to 30 days through our webcam archive: Port Fever. 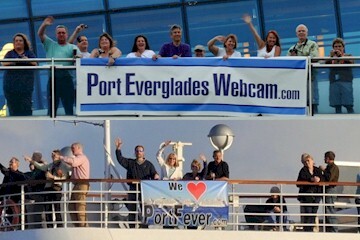 Recordings of our live webcam video from Port Everglades sail-aways may be replayed here. For a more permanent memento, sail-away video may also be available for sale as a digital download... contact us for more details. You may include our video in your own personal vacation video or perhaps gift as a DVD. Please note that we are no longer taking hi-res photographs on a regular basis. Fill out the form below to submit your request. If you have a banner, make sure you also bring something (rope or tape) to secure it to the railings... it can be windy! Webcam wave banners can be colorful country/state/college/team flags or fun/creative expressions of your group's "wish you were here" message to friends-n-family back home. We will not show commercial advertising or political campaigning. Your request will be ignored if we see either. The more advance your notice, the better. Due to the volume of requests we regret that we are unable to personally respond. However, you should receive an automated confirmation email. Barring unforeseen circumstances or technical outage, we intend to cover all cruise ship sail-aways with our HD webcam. Please remember that we cannot guarantee that we will find you on any particular sail-away. If your ship is delayed and departs after dark, it is very unlikely that you will be visible on our webcam. 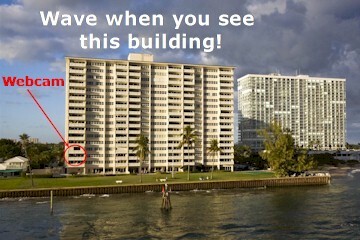 Very important that you provide your intended location on the ship during sail-away e.g. port side balcony cabin number, exact top deck railing position, bow/helipad, bridge wing, etc. and	details of a unique identifier like a colored banner or flag or balloons. What you will be wearing, color of your hair, shirt, hat, etc. are not acceptable as the only means to identify you. Remember... you will be on a ship with many thousands of other passengers. You need to stand out. "Blond hair" or "red tropical shirt" don't do it!!!!! Our webcam can only see the bow, port side and aft of vessels leaving the port. Your location must be in one of those areas. REQUESTS THAT DO NOT MEET THESE CRITERIA WILL BE IGNORED. Where will you be standing?